We are so excited to host Full Plate Thursday on Cinco de Mayo, what a great fiesta we will have. We have had such a busy time here at the cottage, sometimes we are running to catch up. I had an amazing weekend with all the ladies at retreat last weekend and was so grateful to have another year with them! We have some great features this week from all your wonderful kitchens. I can't wait to see what you are bringing today to fill our plates and thank you so much for coming to the party! Oh there are so many delicious recipes here! We will for sure have to check out that Chile Relleno Bake! YUM! Thanks so much for featuring our Chicken Enchilada Soup :) Have a wonderful weekend! Happy Cinco de Mayo! It isn't much of celebration up North, but I love the idea. Have a fun time and thanks for the party. OH mt, Miz Helen, I should make your Chile Relleno bake in honor on my late beloved. He loved chile rellenos so much, and I'm sure your casserole is so delicious. Thanks for featuring my ice box lemon pie. I am truly honored and will happily take home a red plate. Happy Mother's Day and thank you for hosting and sharing your kitchen with us. Thanks for the party Miz Helen! That creamsicle pie had me drooling last week, I am not surprised it was most viewed! Happy Mother's Day, I hope some one is cooking for you for a change! Love your tutorial on your chile Relleno Bake.. so easy to follow. Happy Mother's Day and thanks for another great party! Hey there Miz Helen! I hope you're having a fantastic week. Thank you so much for featuring my crock pot chicken chili this week. Happy Cinco de Mayo friend! Yummy features. Always delicious. Thanks for hosting every week. Thanks for another wonderful party. The features are awesome. Enjoy a wonderful Mother's Day weekend. Thanks for the party, Miz Helen! Wishing you a Happy Mother's Day! Thank you for the party, Miz Helen! Wishing you a fabulous week! Happy Cinco de Mayo and thanks for the party Miz Helen! 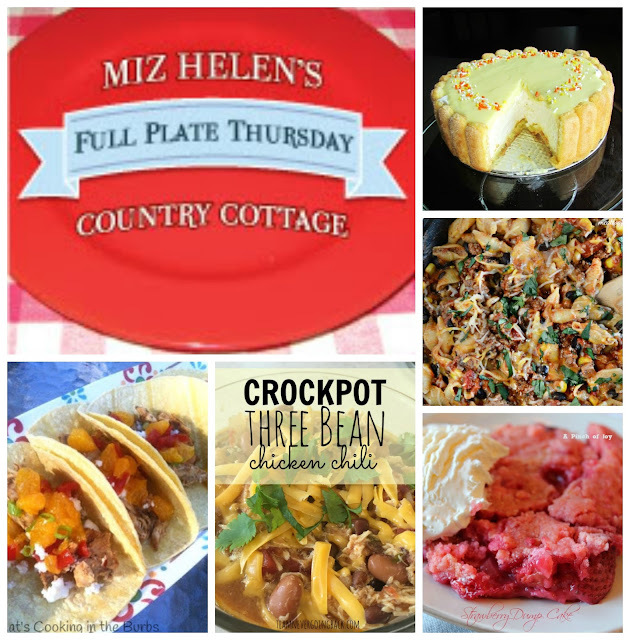 Thanks for featuring my Caribbean Jerk Chicken Tacos, Miz Helen! Have a great rest of the week and thanks for the party! There are so many great recipes here, thanks for hosting! I can't wait to try some of these things!